Three Minute Thesis (3MT®) is an international research communication competition, designed to help students improve public speaking skills with public audiences. At Mizzou, 3MT® is also a professional development program that includes training (storytelling workshop), practice sessions with feedback, and a public speaking competition. 2018 Mizzou 3MT® Competition is scheduled for October 25 in the Leadership Auditorium, MU Student Center. Events will begin at 7:00 p.m.
You must be a doctoral candidate in a research-based degree program. You will have 1 slide and 3 minutes to effectively explain your research to a lay (non-specialist) audience. The public is invited to attend the final competition to vote on the People’s Choice Award! The overarching aim of Mizzou 3MT® is for graduate students to acquire effective public speaking skills. This professional development program includes storytelling training; presentation seminars; practice sessions with feedback; individual consultation with feedback; and a fall public speaking competition, Mizzou 3MT®. articulate how their research benefits society (broader impacts). Conquering your fear of public speaking – and honing your talent – will set you apart on the job market: Multiple surveys have shown that verbal communication skills are in high demand by employers across job sectors. Once you develop the ability to communicate your ideas effectively, you will be able to apply the skill during job interviews, conference presentations, classroom instruction, or pitching your innovation to potential investors. meet all Mizzou 3MT deadlines. Those who have successfully defended during the fall semester may still participate in 3MT, as Mizzou graduate degrees are not conferred until December commencement. Those who have have graduated are not eligible. You MUST be available for orientation, and all competition rounds (based on the number of participants, it may be necessary to hold preliminary rounds, semifinals, and finals). 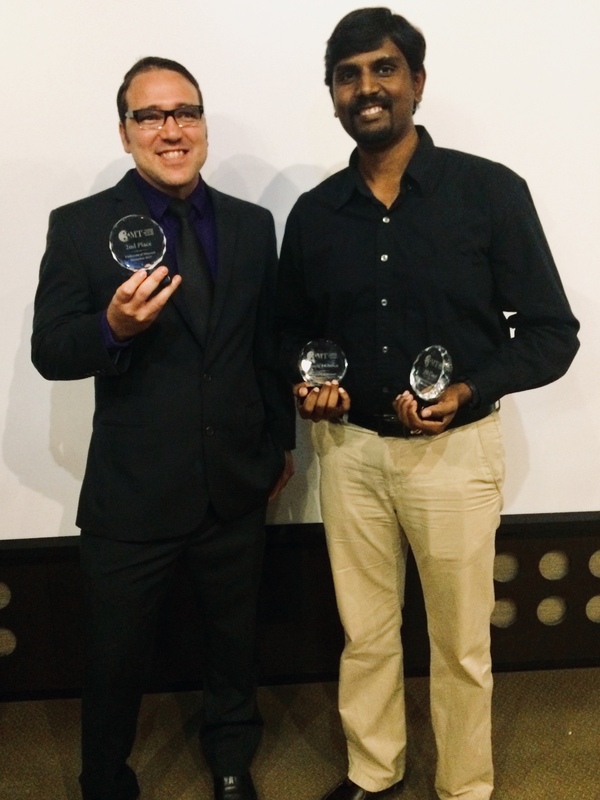 If selected as one of the Mizzou’s 3MT® winners, competitors must also agree to (a) further professional development to hone presentation skills and (b) participate in a regional 3MT® competition at the Midwest Association of Graduate Sschools (MAGS) in Spring 2019. Travel expenses will be paid for by the University. The presentation must be made in English. A single static PowerPoint slide is permitted. No slide transitions, animations, or ‘movement’ of any description are allowed. The slide is to be presented from the beginning of the oration. Presentations are limited to 3 minutes maximum. Competitors exceeding 3 minutes (i.e., those who continue to talk) are disqualified. Presentations are to be spoken word (e.g., no poems, spoken word performances, songs). *Additional rules for Mizzou’s 3MT® contest: When the planning committee notifies you of your presentation time (about a week before the competition), you must re-confirm your participation AND submit your single slide for the competition. Failure to confirm or submit your slide by the deadline will result in disqualification. The Mizzou 3MT competition rounds will be held in a campus auditorium. Depending on the location we are able to reserve, you may be presenting from a stage, but without a podium. Your one slide will appear on a screen behind you. There are no microphones, so be prepared to speak loudly so that you can be heard and understood clearly. The number of contestants will dictate the number and type of rounds we hold. It is possible to have preliminary rounds, a semi-final round, and a 3MT final round. We recommend professional or business attire. No jeans. Truman’s Closet is service for Mizzou students who wish to borrow business attire for special events and job interviews free of charge. You must present your 3 minute speech during your assigned dates/times. On the date(s) of the competition, check in at the registration desk 45 minutes prior to your scheduled speaking time. We will ask you to sign a photo/video release. You may decline, but mark your form accordingly. You must remain in the room until dismissed. A timekeeper will notify you when it is your time to present. Move to the front of the room. When the judges are ready, the timekeeper will tell you that you may commence with your presentation. Once you begin speaking, continue to deliver your entire speech. Even if you lose your place, the clock will continue to run. You cannot restart. The timekeeper will hold up a 30-second warning sign to let you know that you are nearing the 3 minute mark. If you keep talking and exceed 3 minutes, you will be disqualified. After each round, the panel of judges will convene to make decisions. While the judges convene, you may leave the room. It is suggested that you stay nearby. Everyone will be invited back into the room for to hear the judging results. At the preliminary rounds and semi-final rounds (if offered), the names of contestants who advance will be announced. At the final event, plaques and prizes will be awarded for first place, runner up, and People’s Choice award. The Mizzou 3MT winner will become eligible to represent the University of Missouri at regional and national competitions, expenses paid. Prizes will be processed after the event. At every level of the competition each competitor will be assessed on two judging criteria. Please note that each criterion is equally weighted and has an emphasis on audience. Was the thesis topic, key results, research significance, and outcomes communicated in language appropriate to a non-specialist audience? 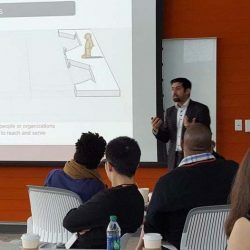 3MT® competitions help doctoral candidates fine-tune their public presentation skills with a long term goal of improving public scientific literacy. Toward this goal, competitors are required to present their research in language appropriate to a non-specialist (lay) audience. Therefore, the Mizzou 3MT planners have invited people from a variety of backgrounds to judge the competition. First Place will receive a plaque and $500 in professional development funds. The first place contestant will represent Mizzou at a regional 3MT contest. Travel expenses will be paid for by the University. People’s Choice will receive a plaque and a $200 in professional development funds. First, understand the two official judging criteria because this is how your Mizzou 3MT® presentation will be scored by the judges. Strategy: When you practice your presentation in front of family, friends, faculty, or research colleagues, give them a copy of the judging criteria. Ask them to rate your presentation. They should be able to respond to every question with a “yes.” Of utmost importance: Your ability to explain your research without technical terms and jargon. Second, your slide must be engaging. It should enhance, not detract, from your educational message. Images should be top quality. Strategy: Ask your mentor, colleagues, and family to critique your slide. Do they respond favorably to the image(s)? Is any part of the slide confusing or difficult to see? Do they believe your slide enhances your public education message? Third, in a 3MT® competition, what you say will be important, but how you deliver your message will be the key to winning. Note: At the start, what did the speaker say and do to immediately capture the audience’s attention? Listen: How did the speaker’s tone, volume and tempo help sustain audience interest? Observe: How did the speaker use eye contact, hand gestures, and/or body movement to emphasize points? Evaluate: Did the presenter avoid jargon and explain technical terms? Assess: How did the speaker make the research both meaningful and memorable for the audience? Simon Clews from University of Melbourne: Making the most of your three minutes. September 7 11:00am – 11:30am in the Eyler Room, S110 Memorial Union. Open to all. September 11 3:00 – 3:30pm in the St. Louis & Kansas City Meeting Rooms, 1209 A&B MU Student Center. Open to all. September 25 11:30am – Noon in the Eyler Room, S110 Memorial Union. Open to all. October 3 or 4; required orientation for registered participants; times and locations to be communicated with registered participants. 2018 Mizzou 3MT® Competition is scheduled for October 25 in the Leadership Auditorium, MU Student Center. Events will begin at 7:00 p.m.
Are all degree candidates eligible? To be eligible, you must be actively pursing a research-based doctoral (PhD) degree. Master’s students are not elegible. For this current competition, you must have your or D3 (doctoral) form and advisor consent form on file by the stated deadline. What is the D3 Form? These are forms that officially document you have reached candidacy status toward earning a degree. Once you have passed comprehensive examinations, the D3 must be filed with the Graduate School. Check with your degree program office for more information. I’ve already defended. Am I still eligible to participate? Yes. In accordance with official policy, you remain a degree candidate until the next commencement (in December), when your degree will be conferred. If you have already graduated, you are not able to participate. I have my candidacy meeting scheduled after the October 1 registration deadline. Can I still participate? Yes, as long as your D3 form is turned in to the Graduate School no later than 5 PM on the deadline. I have plenty of research data, but I have not yet reached candidacy (i.e. no D3 has been filed). Will I be able to participate? No. To participate, you must be a degree candidate (with a D3 form on file) by the deadline. 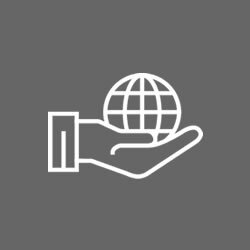 Are international doctoral candidates eligible? What if English is not my native language? Yes, international students at Mizzou who are degree candidates in research-based graduate degree programs are eligible. The three minute presentation must be made in English. Can master’s students who are pursuing research-based degrees participate? No. However, due to popular demand by students, we hope to create a Master’s Division in the future. Why do I need my advisor’s signature on the Consent Form? In some disciplines, research findings must be embargoed until the study is published. This is especially true of students working in classified labs. We need to make certain that your advisor is aware, and approves, of your participation in this event. Dress is either business casual or business attire. No jeans, please! Here’s why: Mizzou 3MT® is a key professional development event for research-based degree candidates. Because of the significance, it is most appropriate for participants to dress as a professional – no different than attending a disciplinary conference or job interview. Another consideration: professional attire can potentially enhance your stage presence, especially because all of our judges are professionals too. If cost for professional attire is prohibitive, Truman’s Closet is service for Mizzou students who wish to borrow business attire for special events and job interviews. Do I have to use a slide as part of my presentation? Do the judges “favor” presentations by STEM students over those in the social sciences or humanities? Not at all! The competition is open to all research-based degree programs. The judges follow the official scoring criteria when making their decisions. No preference is given to one discipline over another. Will you have separate rounds for life sciences, engineering, social sciences, humanities, etc.? At Mizzou 3MT, everyone competes together. In the future, if the competition grows substantially, we may offer disciplinary preliminaries. Why are people from higher education on the judging panel? As you know, our intent with Mizzou 3MT is to select a winner who can best describe research to a lay (public) audience. Thus, we make every attempt to find people in the local community (outside of higher education) to serve as judges. This proved to be a challenge, so we also invited faculty and administrators from inside higher education to serve as judges. That said, all judges are volunteers (not paid) and they do their best to follow the scoring criteria. Be assured that they are committed to spirit and intent of the Mizzou 3MT competition. Will I get to see the judges’ comments? No, for several reasons. 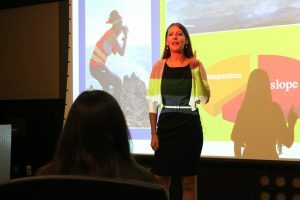 Foremost, Mizzou 3MT® is a professional development, public speaking program that culminates with a competition event. The training sessions (e.g., storytelling) we offer in the months prior to the event are designed for you to practice and receive constructive feedback in order to improve your public speaking skills. The second consideration is our volunteer judges, many of whom prefer to keep their comments confidential. Remember that the results of any judged competition is based on subjective opinion. A 3 minute presentation that resonates with one judge may not appeal as much to second or third judge. Tip: Please seek feedback on your slide, content, and presentation style before the competition. In the past, many of the finalists took advantage of the storytelling training and/or practice session. Their success proves it pays to practice! 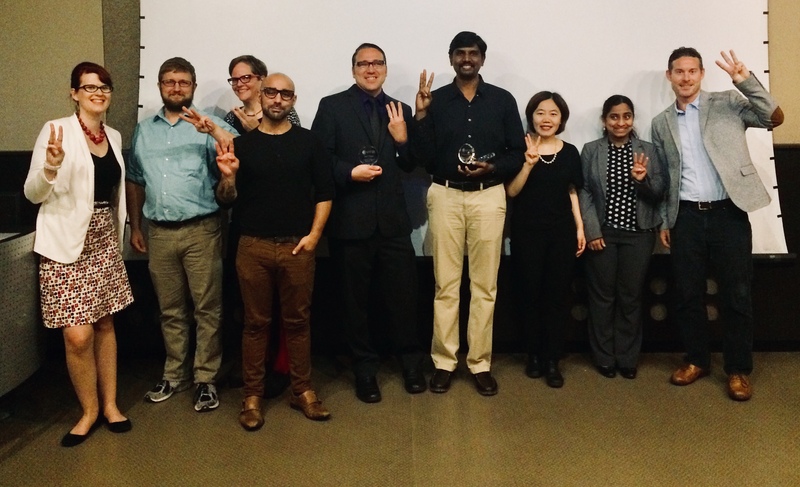 Contestants in the Mizzou 3MT® 2017 competition. That was the message delivered by the 2017 Mizzou 3 Minute Thesis winner Susheel Bhanu Busi, a doctoral candidate in Molecular Pathogenesis and Therapeutics. Audience members also voted Susheel as the People’s Choice winner! Second place was awarded to Freddie Jennings, a doctoral candidate in Communication. Nettie Brock, Communication. A Thousand TV Shows. Mentor: Dr. Ben Warner. Ryan Dibala, Natural Resources. Trees Providing Forage for Livestock. Mentor: Dr. Shibu Jose. Anna Perinchery, Biological Sciences. You are what you eat! 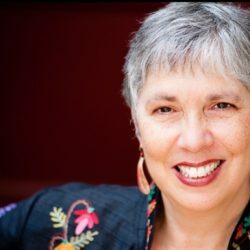 Mentor: Dr. Elizabeth King. Zach Rubin, Sociology. Lifestyle and Activism: The Key Ingredients. Mentor: Dr. Victoria Johnson. Lisa Groshong, Human Dimensions of Natural Resources. Climate change doesn’t care. Mentor: Dr. Sonja Wilhelm Stanis. Liga Wuri, Animal Science. Vitrification for Fertility Preservation. Mentor: Dr. Yuksel Agca. Alex Howe, Philosophy. Citizenship Goes to the Dogs. Mentor: Dr. Peter Vallentyne. Judges for the evening were Provost Garnett Stokes; Dr. Jeni Hart, Dean of the Graduate School and Associate Vice Provost for Advanced Studies; and Dr. Keven McDonald, UM System Chief Diversity Officer & MU Vice Chancellor for Inclusion, Diversity and Equity. MC for the evening was Rachel Bauer, doctoral candidate in Theatre. 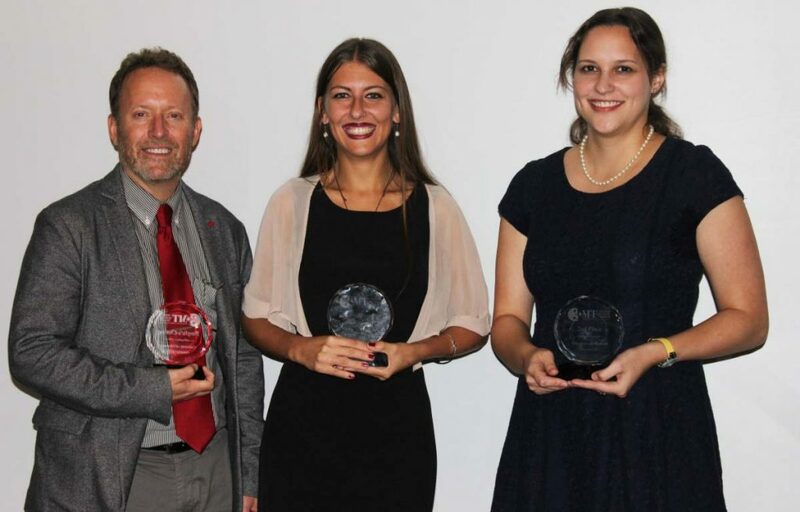 First place winner was Jacqueline Gamboa (middle); second place Dr. Michael K. Fink (right), and People’s Choice Megan Sheridan (left). Thirty doctoral candidates participated in the first annual Mizzou Three Minutes Thesis competition. 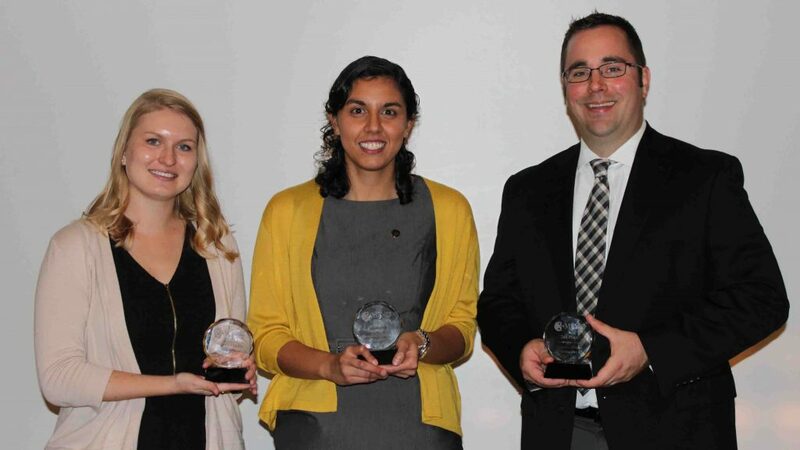 First place winner was Arianna Soldati (middle); second place Jessica M. Anderson (right) and People’s Choice Lincoln Sheets, MD (left). Three Minute Thesis (3MT®) is a research communication competition developed by The University of Queensland (UQ) in Australia. The exercise challenges doctoral* candidates to present a compelling oration on their thesis (dissertation) topic and its significance in just three minutes. 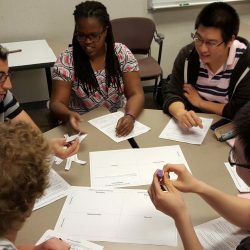 3MT® develops academic, presentation, and research communication skills and supports the development of research students’ capacity to effectively explain their research in language appropriate to a non-specialist audience. To view winning presentations from around the world, go to the 3MT® Showcase on the official UQ site.